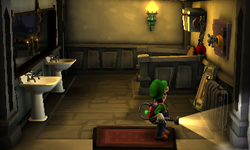 The Restrooms (Toilets in PAL versions) are two connected rooms in the Treacherous Mansion in Luigi's Mansion: Dark Moon. During the mission Double Trouble, Luigi can go here, but the other access is invisible and must be revealed with the Dark-Light Device. In the first area, Luigi can find a Diamond by flushing the toilet. If Luigi attempts to go on the toilet, he is tricked by a Strong Greenie and is flushed up in the air, but Luigi can capture the ghost. In the next area, a Strong Slammer is reading a newspaper on the toilet, Luigi must pull the chain to capture the ghost. In Paranormal Chaos, the room is infested with ghosts that have to be captured. In Terrifying Invasion, the Restrooms is one of the rooms that may be infested with ghosts. This page was last edited on September 24, 2017, at 03:50.